Kentucky Fried Chicken (KFC) Philippines always have great meal deals going on. Why are people drawn to combo meals? There are savings when you buy a combo meal than buying all the components ala carte. Savings from a promo is a very important factor in purchase decisions. However, the computations that KFC uses for what you save with its meal deals are confusing and inconsistent. PHP 381 of savings, really? In that case, that would mean that the KFC Bucket Meal Specials (let’s shorten it to BMS) is really worth PHP 1,080 ala carte. 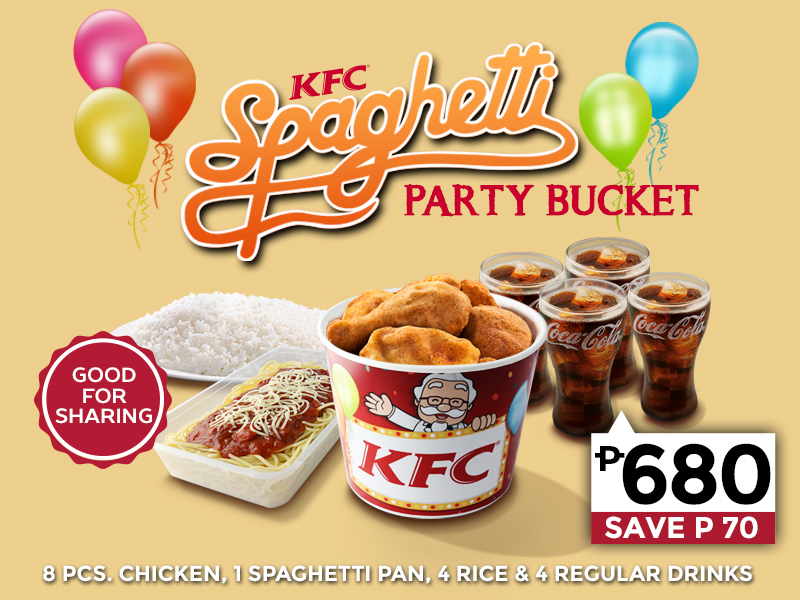 The KFC Spaghetti Party Bucket (let’s shorten it to SPB), based on the first image is worth PHP 750 a la carte. What the two promos have in common are the 8 pieces of chicken, and 4 regular drinks, so the price difference is due to the other components. BMS has 4 fixed-ins vs a spaghetti pan for SPB. Regular fixed ins are worth PHP 35 each, four costs PHP 140. There’s no price for a pan of spaghetti in KFC’s menu. Assuming that the pan is about four servings; whereas a serving of spaghetti costs PHP 50 in KFC., the pan should cost PHP 200. This component puts SPB up by PHP 60 over BMS. Based on the computations above. The ala carte price difference between the Bucket Meal Specials and Spaghetti Party Bucket should only be PHP 20, far from the PHP 330 “SAVE” difference. With KFC’s advertisement, a consumer will most likely buy the Bucket Meal Specials because he thinks he is getting a great deal because of the PHP 381 advertised savings. A consumer will less likely buy the Spaghetti Party Bucket because he thinks the deal is not so good PHP 70 advertised savings. The promo price difference is PHP 19 (699 for BMS and 680 for SPB). The ala carte price difference is PHP 20 in favor of BMS from the computations in this post. If you ignore the one peso, the deals are practically equal in savings for the consumer. You can order both here. Why was the rationale behind the misleading “SAVE” numbers by KFC? 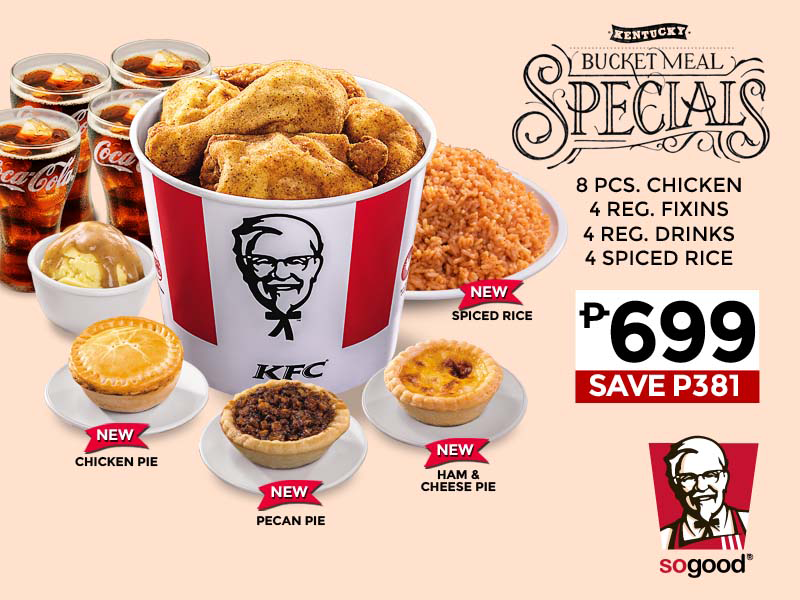 Is KFC trying to pimp the Bucket Meal Specials more because the spiced rice and pastry pies are not selling well by themselves? I tried to do the same with the “SAVE” of other popular KFC combo meals such as the Fully Loaded Meals… Again, KFC’s computations are out of whack. The lesson here is to just look at the promo price – the amount that you will actually be paying – and just ignore the “SAVE” advertised. Some other restaurants will do the reverse. They will not actually reveal the “YOU SAVE” amount because it the deal will be exposed as bad. For this, see my post about the Dunkin’ Donuts 3-3-12 promo here. This post is surprisingly one of my most popular. Fortunately for KFC, I like KFC chicken so much that it doesn’t matter whether the company’s “SAVE” computations are inconsistent and unreliable. For me, the quality of their products have been consistently good and reliable. In the end, that’s what matters anyway.